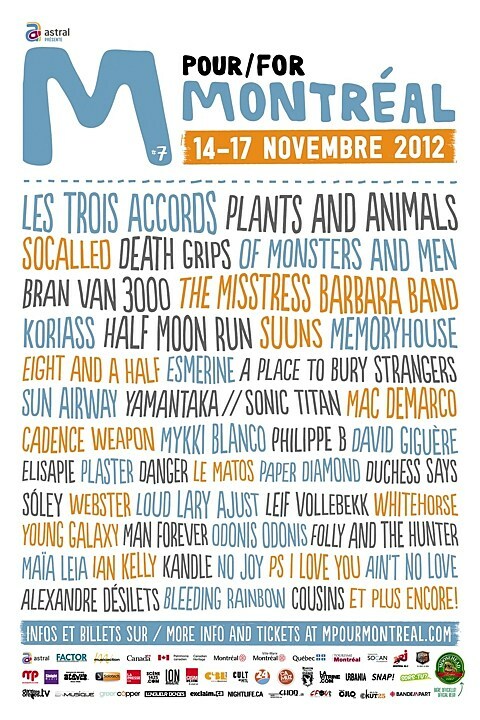 The seventh annual M for Montreal festival happens next week (November 14 – 17) in its namesake Canadian city. Previous years, M4M has featured mainly Montreal (and other parts of Canada) artists, being showcased to a group of “international delgates” (talent buyers, journalists, music supervisors, tour agenents and other industry types) in a tightly controlled set of shows, this year’s fest expands its scope with nearly 100 performer at 16 venues, giving it more of an actual festival feel than an industry conference that has music showcases the public could by tickets to. The line-up is much more global this year as well, with musicians from France, Iceland and, for the first time, the United States playing alongside bands from all over Canada. Artists playing the 2012 edition include Death Grips, Of Monsters and Men, Mac DeMarco, Suuns, Mykki Blanco, Sun Airway, A Place To Bury Strangers, Cadence Weapon, Memoryhouse, Yamantaka // Sonic Titan, Bleeding Rainbow and Blue Hawaii. Full list of performers is below and daily schedule is here and advance tickets to shows and panel discussions are available. Like in years past (2011, 2010, 2009, 2008), I’ll be heading up for the M fest, and will be reporting the goings-on. If you want a taste of Montreal this week in NYC, beyond the snow we’re currently experiencing, Montreal rapper Cadence Weapon plays Glasslands on Friday (11/9) with Fat Tony. Tickets are still available. Cadence Weapon tour dates are listed below.